Installed at Carlton Packaging, four Chargemaster 7kW fast chargers, providing eight charge sockets in total, are already being used by the company’s plug-in vehicles, which are used for travelling to client meetings. Carlton Packaging director, Alan Magee, said: “We recognise the need for sustainable development and continually aim to improve the environmental effect of our activities. We are focused on reducing our emissions, which led us to introduce electric vehicles into our fleet, and installing EV charging points allows us to get the maximum environmental benefit from them. 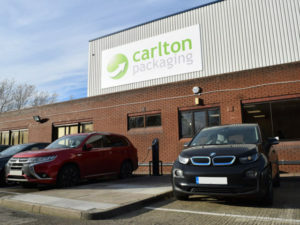 Carlton Packaging director, Alan Magee, said: “We recognise the need for sustainable development and we are focused on reducing our emissions, which led us to introduce electric vehicles into our fleet, and installing EV charging points allows us to get the maximum environmental benefit from them.